Get ready to transform yourself into a real wizard when you order Harry Potter Chess! Each richly-illustrated chess manual teaches you the skills to play like a master — whether you're a beginner or already know the game. 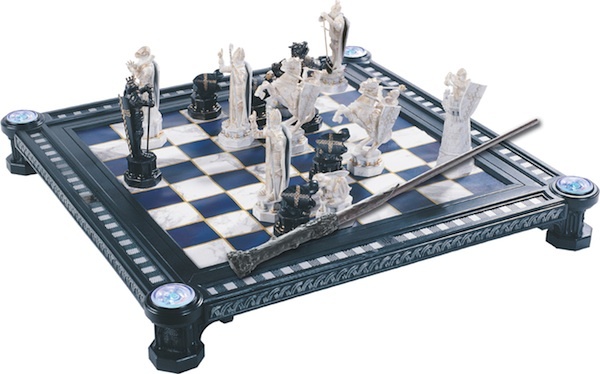 The authentic, scaled-down replica of the giant wizards chess game from Harry Potter & The Sorcerer's Stone lets you bring chess-playing fun to life — right in your home! Each piece is "enchanted" with its own special effect: Knights neigh, Queens glow, Bishops crash and Rooks float as if by magic! This set is not available in stores so order yours today before this limited time offer disappears. The Harry Potter Chess Manuals — 32 easy-to-follow teaching guides designed to help you first master the basics, then more advanced strategies of the game, along with Harry, Ron, Hermione and friends! 32 Authentic Replica Chess Pieces, each with a thrilling special effect inspired by the film! 2 Magic Wands that actually guide your Rooks on the board — as if by magic! A Dazzling, Light-Up Chess Board to illuminate your progress in the game. A Signed Certificate of Authenticity, proving this is an authentic replica from Harry Potter & The Sorcerer's Stone.